Thatâ€™s what I do, I drink and I print things. 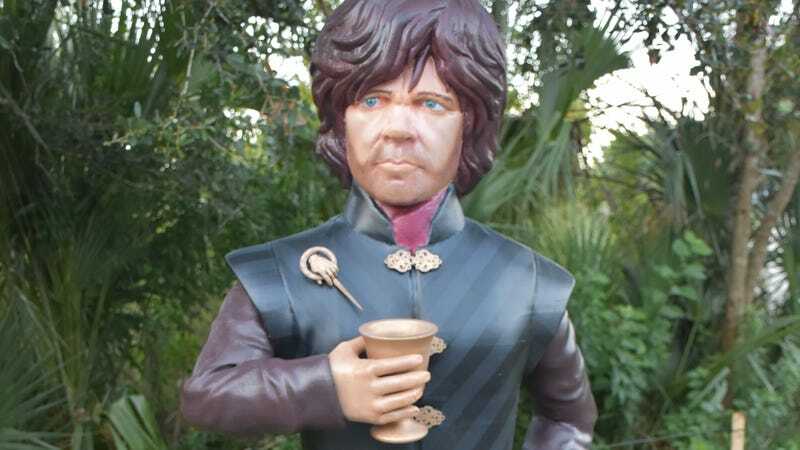 A 3D printing enthusiast has unveiled his latest creation, a life-sized version of Peter Dinklageâ€™s Tyrion Lannister from Game of Thronesâ€”which now gets to chill in his backyard drinking booze and sharing bawdy tales by the fire. Only donâ€™t let him get too close. He might melt. Thingiverse user Jeff Christianson, or Sir Ken, shared the design and end result for his 4’5″, 25-pound Tyrion Lannister figure that he built using his Creality CR-10s 3D printer. He based his creation on another design, but this one was much, much biggerâ€”taking over 1,400 hours to print the 10 pieces needed to make the finished product (and thatâ€™s not including all the sanding, filing, and layers of paint). An image of the model for the 3D printer. Itâ€™s broken up into 10 pieces. Full design is available online. The back and sides of the final figure, which matches actor Peter Dinklageâ€™s height. Christianson told io9 via email that he mainly chose to do a Tyrion Lannister figure because he wanted to experiment in facial painting, but his Game of Thrones fandom definitely played a part. Now that the Tyrion Lannister figure is done, he is working on sewing him a cloak, then he and his wife are thinking of taking him cross-country in an RV, photographing him with different American landmarks like Mount Rushmore and the Grand Canyon. Possibly for a YouTube series. But in the meantime, heâ€™s busy protecting the Realmâ€”or actually, not. Soon, you might be able to join him on the road with a Tyrion of your very own. Anyone with a 3D printer and a bit…ok, a lot of time on their hands can try making the Tyrion Lannister figure themselvesâ€”Christianson has put his entire design on Thingiverse for free. Susquehanna Bancshares set a $16.00 price objective on 3D Systems (NYSE:DDD) in a research note issued to investors on Friday, August 10th. The brokerage currently has a hold rating on the 3D printing companyâ€™s stock. DDD has been the topic of a number of other research reports. Zacks Investment Research raised 3D Systems from a sell rating to a hold rating in a research report on Tuesday, July 3rd. ValuEngine raised 3D Systems from a sell rating to a hold rating in a research report on Wednesday, May 2nd. JPMorgan Chase & Co. set a $9.00 price target on 3D Systems and gave the stock a sell rating in a research report on Thursday, May 3rd. Loop Capital boosted their price target on 3D Systems to $17.00 and gave the stock a hold rating in a research report on Wednesday, August 8th. They noted that the move was a valuation call. Finally, B. Riley boosted their price target on 3D Systems from $7.00 to $9.00 and gave the stock a sell rating in a research report on Wednesday, August 8th. Six research analysts have rated the stock with a sell rating, seven have assigned a hold rating, two have given a buy rating and two have issued a strong buy rating to the companyâ€™s stock. The stock has a consensus rating of Hold and a consensus price target of $13.49. NYSE DDD traded down $0.18 during trading on Friday, reaching $19.04. 2,302,513 shares of the companyâ€™s stock were exchanged, compared to its average volume of 2,813,860. The company has a market cap of $2.27 billion, a PE ratio of -33.40 and a beta of 1.26. The company has a quick ratio of 1.44, a current ratio of 1.95 and a debt-to-equity ratio of 0.01. 3D Systems has a fifty-two week low of $7.92 and a fifty-two week high of $20.00. 3D Systems (NYSE:DDD) last announced its quarterly earnings results on Tuesday, August 7th. The 3D printing company reported $0.06 earnings per share for the quarter, topping analystsâ€™ consensus estimates of ($0.06) by $0.12. The firm had revenue of $176.57 million for the quarter, compared to the consensus estimate of $165.83 million. 3D Systems had a negative return on equity of 9.22% and a negative net margin of 11.54%. research analysts anticipate that 3D Systems will post -0.15 EPS for the current fiscal year. In related news, Director G Walter Loewenbaum II purchased 4,500 shares of the businessâ€™s stock in a transaction that occurred on Tuesday, May 29th. The stock was acquired at an average cost of $12.06 per share, for a total transaction of $54,270.00. The transaction was disclosed in a legal filing with the Securities & Exchange Commission, which is available at the SEC website. Also, EVP Andrew Martin Johnson sold 5,000 shares of the businessâ€™s stock in a transaction that occurred on Friday, August 17th. The shares were sold at an average price of $19.01, for a total value of $95,050.00. The disclosure for this sale can be found here. 5.00% of the stock is currently owned by corporate insiders. Hedge funds have recently modified their holdings of the stock. Alps Advisors Inc. bought a new stake in shares of 3D Systems in the first quarter valued at approximately $117,000. Oppenheimer & Co. Inc. bought a new stake in shares of 3D Systems in the first quarter valued at approximately $120,000. Private Advisor Group LLC bought a new stake in shares of 3D Systems in the first quarter valued at approximately $147,000. Xact Kapitalforvaltning AB bought a new stake in shares of 3D Systems in the fourth quarter valued at approximately $116,000. Finally, CIBC Asset Management Inc bought a new stake in shares of 3D Systems in the second quarter valued at approximately $205,000. Institutional investors and hedge funds own 66.07% of the companyâ€™s stock. The optimal treatment for humeral shaft fracture remains controversial. Although a large proportion of these fractures can be treated without surgery, a recent study, involving a randomized controlled trial, compared bridge plate with functional brace fixation for humeral shaft fractures and concluded that surgical plating has a statistically significant advantage with a better DASH score, lower non-union rate, and lower residual deformity rate . As for proximal third humeral shaft fractures, they were thought to be complicated with a higher non-union rate when treated conservatively compared with middle and distal fractures [2, 5, 16]. Since the helical plating technique was introduced for the treatment of humeral fractures, some studies have shown that this technique resulted in increased stiffness compared to fixation with a straight plate under torsional loading and produced satisfactory clinical outcomes [14, 17]. However, how to produce a suitable helical plate for each individual patient is a big question for surgeons. Previous studies have proven that the 3D printing technique is a good tool for designing surgical plans and pre-contouring plates used to treat other bone fractures [18â€“20]. Our results demonstrate the benefit of pre-contouring plates on a 3D-printed model for this special technique. In this study, all kinds of fractures (from type A to type C) were treated by helical plating technique, and satisfactory outcomes were obtained. It was coincident with our previous cadaveric study results , so we thought this special technique was a good choice for these fractures. Previously, Stedtfeld and Biber reported that approximately 49.3% of the proximal third humeral shaft fractures extend into the humeral head and that this type of fracture cannot be characterized by conventional AO classification . In our study, a total of 41.3% (19/46) of fractures involved the proximal humerus, a rate slightly lower compared with their report, but still a high rate of these fractures. Consequently, attention should be paid on the proximal third humeral shaft fractures since about half of them need adequate proximal fixation. At the 1-year follow-up visit, all fractures were healed and none of the patients had suffered non-union, an outcome better than that reported for other treatment methods [1, 2, 5, 9, 21â€“23]. The mean union times of the Synbone group and the 3D-printed groups were 16.16 and 15.57Â weeks, respectively, which was similar to other studies even though our patients were older than in other studies [11, 17, 24]. Functional evaluations were satisfactory but were worse than those reported by others who conducted the same surgeries (Constant-Murley score 76.80, 76.95 vs. 88.6) [13, 17]. This may be attributed to the fact that our population was much older, so that humeral fracture might be combined with rotator cuff degeneration in our enrolled patients. The primary outcomes of this study were that surgical duration and blood loss were reduced by the use of a 3D-printed model for pre-contouring the plates before surgery. This result was consistent with our hypothesis and can be explained by the fact that the humeri of older patients in our country are much shorter than the standard Synbone, requiring surgeons to adjust the plates during surgery. Since the 3D-printed model represented the actual size of the bone, the plates pre-contoured on these models were always suitable for fixing the fractures. Because of MIPO technique application, there was only 15Â ml of blood loss difference between the two groups; maybe it was not clinically relevant, but on the whole, it reduced 12.5% of blood loss volume and presented a small part of the benefit of 3D-printed technique. We compared the outcomes between the two grades of surgeons in the 3D-printed group. Although senior attending doctors are much more experienced than junior attending doctors, the results showed that there was no significant difference between them in terms of outcome. We believed that the 3D printing technique would make this novel technique much easier and make it available for use by less specialized surgeons. However, since all fractures in the Synbone group were finished by senior attending doctors, it was impossible to compare the results with a control group. There are some limitations to this study: (I) the retrospective design limits the level of evidence and only represents one single center; (II) some patients who died within 1Â year of surgery are excluded from this study, which may influence the final results; (III) all these surgeries were finished by surgeons in one trauma center, so personal differences cannot be avoided; and (IV) this study only included Asian population, and maybe the results could be challenged by other races because of different skeletal sizes.